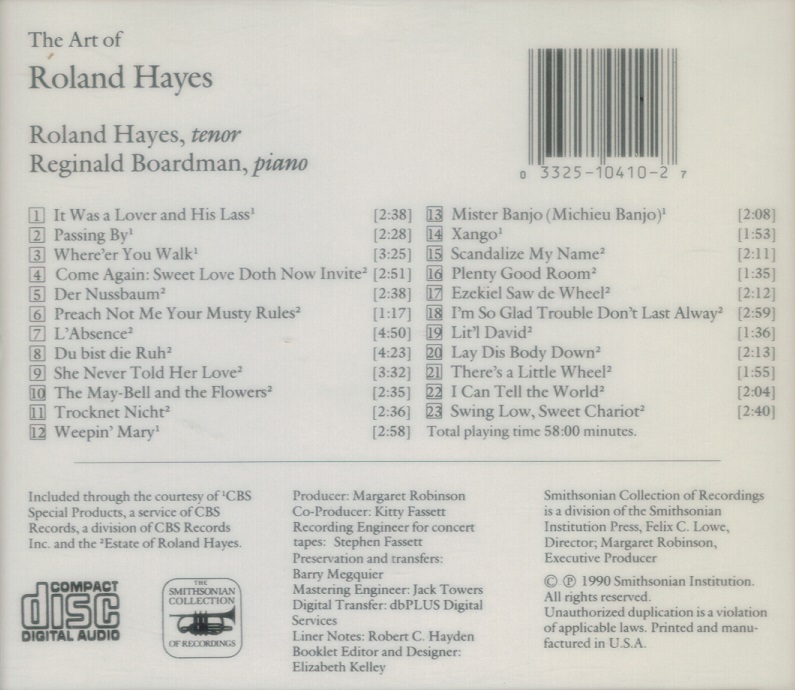 “Tenor Roland Hayes is acknowledged as a masterful interpreter of both classical songs and black spirituals. In a career that spanned more than thirty years, he performed throughout the United States and Europe. Hayes shattered the color barrier in the world of classical music, becoming one of the highest paid musicians of his time and paving the way for later African-American singers. Summing up Hayes’s career, Marva Griffen Carter wrote in the Black Perspective in Music: ‘Hayes’ life of almost ninety years reveals a remarkable story of a man who went from the plantation to the palace, performing before kings and queens, with the finest international and American orchestras. Hayes made his formal singing début at Boston’s Symphony Hall, 1917 (rented by the singer himself, then an unprecedented step for an African American). His performance of lieder by Franz Schubert and arias by Mozart and Tchaikovsky created a sensation. In early 1918 Hayes began a U.S. tour, which he managed himself, and in 1920 he set sail for London. After a year of scraping by with whatever small performances came their way, Hayes and his accompanist, Lawrence Brown, were booked to perform at the prestigious Wigmore Hall. Although he was suffering from pneumonia, Hayes sang masterfully. Two days later he gave a command performance for King George V and Queen Mary. 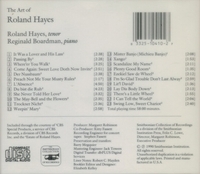 While in London, Hayes also studied lieder singing with Sir George Henschel. Upon his return to the United States in 1922, the world famous Hayes performed again at Symphony Hall in Boston to rave reviews. Shortly afterward he became the first black singer to appear at Carnegie Hall in New York City. Hayes then began a series of concert tours that took him to nearly every corner of the country. By 1924 he was performing more than eighty concerts per year, many with major orchestras, such as those in Boston, Philadelphia, New York and Detroit. Hayes taught at Boston University, beginning in 1950. ‘To be sure, Mr. Hayes knows what he is living: there is a classic balance between his intellectual comprehension and his emotional concept. The consequence is an atmosphere so intense as to be gripping.... [The listener] is in the presence of a master’ wrote Boston Herald music critic Rudolph Elie. 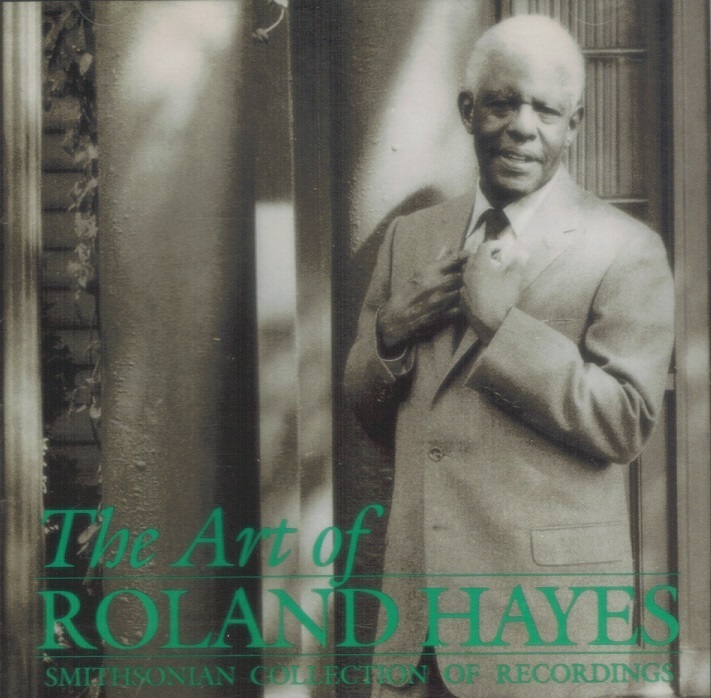 In 1962, on his seventy-fifth birthday, Hayes gave his farewell concert at Carnegie Hall.